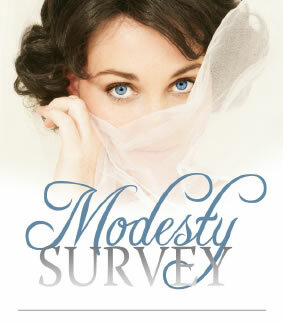 Though the Modesty Survey by The Rebelution, a teen ministry founded by brothers Alex and Brett Harris, was taken offline in early 2014 in the wake of complaints that it was unfairly shaming to women, this review by Fashion Belle is staying online as a tribute to the impact the survey had on the Christian community. The survey was conducted in 2007 with over 1,600 men of all ages participating. The introduction to the survey results stated, "It's everything girls have ever wanted to ask guys about modesty but were afraid to ask!" It was a popular resource for the seven years it stayed online. The men's written comments accompanying survey results offered a few surprising insights. For instance, several men said that a woman's sleeve or skirt with transparent fabric or a slit is more of a problem for them than a sleeveless top or short skirt without those elements. They said slits and transparent layers caused them to instinctively look to see how far those elements extend and whether they are repeated elsewhere on the body of the garment. Many also said that fabric that simulates skin color is problematic, as it invites them to examine where the line begins and ends. When asked what men found attractive, the word "feminine" came up often, and many defined "immodest" as a look that a woman creates with intent to seduce. Of course, many women do not have that intention when they dress in ways that some men find provocative, they just don't realize the extent to which what they wear affects men. The Rebelution site stated, "We're not telling you what to wear--we're just telling you what we, as guys, have to guard against."